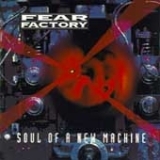 FEAR FACTORY - SOUL OF A NEW MACHINE (CD) | Online Shop | Wizard LTD. Album: "SOUL OF A NEW MACHINE (CD)"
Guitarist Dino Cazares has stated that this album is a concept album, concerning man's creation of a machine that could be either technological or governmental. It was also confirmed by bassist Christian Olde Wolbers in an interview. The machine-human connection would play a more prominent role in the later Fear Factory concept albums. The sound of this album is different from the later albums for it was heavily influenced by Napalm Death and Godflesh, therefore this one featured more of a death metal and grindcore sound. Many feel this album is ground breaking as this is the first album to mix death growls with clean vocals. While Fear Factory's main concept is man vs. machine, this album featured different themes. "Martyr" is about how Burton C. Bell was bored with his lifestyle; "Leechmaster" and "Manipulation" are about relationship troubles; "Scapegoat" was based on how Cazares was once wrongfully accused by the law; "Crisis" is an anti-war song; "Crash Test" concerns animal testing and "Suffer Age" is based on serial killer John Wayne Gacy. The other songs contain different themes as well. Samples from the movies Full Metal Jacket, Blade Runner and Apocalypse Now are heard sporadically throughout the album. All music composed by Dino Cazares and Raymond Herrera; all lyrics written by Burton C. Bell except where noted. Darius Seponlou – introduction on "Crash Test"